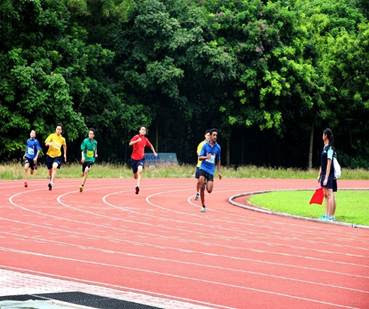 On the 2nd of April, the students of SMK Bandar Utama Damansara (3) participated in their annual Sports Day. Held at Stadium Sains, Universiti Malaya, this day was eagerly anticipated by supporters and athletes alike. The day kicked off with a march, which had various uniform bodies represented by their respective contingents. Athletes the marched in after them, and presented a short performance. They were dressed inspired by their mascots. The Red House mascots were Mickey and Minnie meanwhile Yellow House mascots were from Beauty and the Beast. The Green House mascots were Tinkerbell and Peter Pan and Blue House mascots were the Genie and Jasmine. After that, Erwin Helmi was called upon the recite prayers. Next, athletes pledged to honour the spirit of good sportsmanship after singing the national anthem and the school song. Then, Mr. Kalearasu, the leader of the Parent-Teacher Association (PIBG) gave a speech, followed by a speech from Puan Zuraidah, our principal. The opening concluded with an entertaining set from the school marching band. Soon, the events began. All the athletes were prepped for the event. The students who were not competing were enthusiastically cheering their friends on. A lot of events took place (mostly track) such as 4 x 100m, 100m, 200m and many more. The teachers were working counting the marks atheletes have earned for their houses. A lot of athletes were tired after competing fiercely in their events. Soon enough, the medal-giving ceremony heralded the end of the events. The students were eager to find our the winning house for the year. The athletes were beaming with joy when they received their medals. The sports house that won 1st place was the Blue House. 2nd place was Yellow House, 3rd place was Red House and 4th place went to Green House. 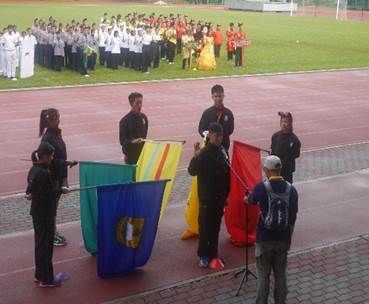 The best marching was won by Yellow House and Youth Cadet Corps. Overall, the winner was Blue House. The Blue House athletes basked in glory, as Sports Day drew to a close. All the students went home with a smile on their faces, putting aside their sports house rivalries until the next year.